A user on NeoGAF, has spilled his guts about what he read in Game Informer about the “Prometheans” in Halo 4. Take with a grain of salt and be wary of spoilars! The Knights are one of three subdivisions within the Prometheans. Crawlers are basically cannon fodder to distract from the Knights. Watchers are support units. They can shield knights, spawn watchers, resurrect knights. Frankie's example of a Knight sniping him, he takes cover behind a column, Crawlers attack him by crawling down from the column. Promethean weapons/equipment designed to fight Flood. There are different variants of Knights, watchers, and crawlers. Knight - Deadly warriors, use weapons like Light Rifle and Supressor. Knight Battlewagon - Rare but incredibly dangerous, huge frames draped in heavy armor and hardlight shielding, can deploy Autosentries, will wield Scattershot if you get too close. Watcher - Wield boltshots, summon crawlers, protect and resurrect Knights. 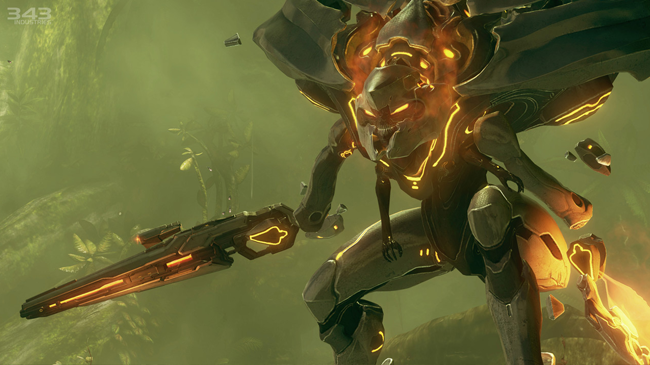 Prometheans work for the Forerunner civilization, "or whatever is left of it." Why do they now appear as robotic entities? Were they always this way? Prometheans are directed by a "general of sorts". First you encounter the Covenant. Then the Prometheans. But it is when they combine forces, and how they combine, that will offer biggest surprises. I'm not sure about these crawlers, they seem like a lame, annoying replacement for Grunts?